One thing I love about Miami is that we definitely have style. Most of the cities in our country are just carbon copies of one another. You could take a subdivision block in Utah and drop it right in the middle of another state and it would fit right in. Miami, on the other hand, is a trend-setter. We have architectural icons in the community, several distinct styles, and a blending of modern art into both our residential, and commercial neighborhoods. 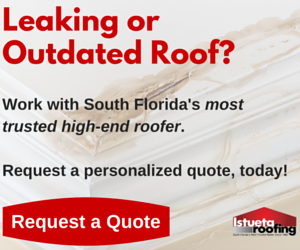 After more than two decades of roofing in the Miami area, the Istueta Roofing team has worked on nearly every style of roof there is in Miami and surrounding areas. Here are a few of our favorite styles that can be found in Miami. If there is one particular architectural style associated with Miami, it would be Art Deco. Because the sauve people of Miami felt the need to make a stand against gaudy and excessive decoration, popular in the 20’s and 30’s, the Deco movement made waves with its emphasis on clean and simple geometric designs. Art Deco features simple shapes that are complimented by a vibrant use of color. Themes and motifs may vary, but you can expect to see flat roofs, symmetry, heavy use of glass and metal, as well as the occasional rounded walls and stairs to add some flair. Early Art Deco heavily influenced later styles; such as the Miami Modernist architectural style. Miami has the largest compilation of Art Deco architecture in the world (over 800 buildings), a lot of them in the Historic Miami Beach Art Deco District. This little jewel is the epitome of Art Deco style, and it draws a lot of attention from travelers, too. You’ll see the familiar elements with symmetrical, straight lines, pastel colors, and the face formed on the building. Lenny Bruce said, “Miami is where neon goes to die”. Whether you like neon or not, the Breakwater is an iconic example of our unique architectural style. Another classic from the Art Deco district is the famous Carlyle Hotel. While my other two examples stand out quite a bit, this hotel takes a less flashy approach. Relying less on neons and pastels and more on it’s one-thirds approach, with the use of lines and curves to make an impression. It must have worked, now it’s a local treasure that’s appeared on the big screen on multiple occasions. While the Art Deco style is mostly seen in historic commercial buildings that have been preserved, the Mediterranean Revival style of architecture that predates it, is still influencing a lot of new homes today. The best examples of this style can be found in Miami Shores. Back in the 20’s when the Shores was being developed, architects took some inspiration from the styles around the Mediterranean Sea such as Spain, France, and Italy. The primary design elements you’ll see include stucco walls, red barrel tiles, and impressive foyers. Just think “colonial villa” and you’ve got it. You’ll see this historic style all over Miami. This is one among the many influences of George Merrick that can be found particularly in the Coral Gables area. The Biltmore pulls enough weight to be registered as a National Historic Landmark. This hotel has quite the history, and it is probably Miami’s centerpiece for Mediterranean Revival architecture. We’ve done a fair amount of homes ourselves that are pulling from that same style. Now, I’m not trying to brag or anything here, but this is one of our favorite roofs we’ve done. This is the Ana Isabella Villa, which was essentially a modern approach to the Mediterranean Revival design. You can find more details and images about this home here. On this edition of “This Old House”, we take a look at the Versace Mansion. The mansion, was built in 1930 by Adlen Freeman. A lot of the updates, such as the south wing, garden, and swimming pool were later added by Gianni Versace when he owned the property. While Art Deco was Miami’s response to some of the over-burdened styles of that age, MiMo was the response to bland, functional international style that became popular after World War II. Rather than minimalist designs that focused on efficiency, Miami Modern focuses on the tropical elements by adding color and fun into the architecture. Look for lots of glass, stone, and combined textures, as well as angles and curves for flare. If there’s one thing you can say about MiMo architecture, it’s that it stands out. I like to think of the Bacardi building as Miami’s “mullet” — it might seem to be all business up front, but it’s all fun in the back. From the handmade tiles to the colored glass– it’s an unreal work of art. Home of the fictional “Dexter”, the Bay Harbor Towers use color to draw attention to key points of the architecture. The structure has clean lines, large windows (for a great view), and a flat roof, all accented with simple decorations and color. Motel Ankara, better known as Aloft, recently got a reboot. It has lots of zig-zag lines, floating staircases, and a cantilevered, winged roof. Eric Nash described it as “…a paper airplane atop a triangular glass lobby.” This is a great example of midcentury Miami architecture. Miami is a haven for world-class, creative architects eager to test out their ideas and put their stamp on something memorable. It’s also a great place to be if you really enjoy being a part of that process. The opportunity to work on such a variety of stunning homes and commercial buildings is one of my favorite things about Southern Florida. We have created some of the most memorable styles, and even as we move into the future with our design, we are always cognizant of our past.